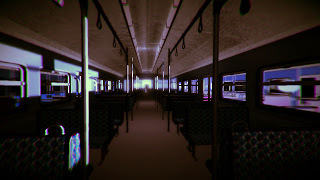 Some horror games are scary, others are just completely psychedelic. Such is the case with A Mother’s Inferno, a twisted and creepy adventure about a train ride gone to hell where you have to save your son. It’s not a game for those who suffer from epilepsy though, since the students who pulled this off created a vision so wacky that will make you think again about facing some creatures that you meet in this train. It’s really flashy, strange, unsettling and completely out of the ordinary, which is something very good.Playing as a mother who has to get her son back with nothing more than a great willpower and a shard of glass, you walk down the train carriages only to find some strange zombie that you have to decapitate, a surreal chicken thing that you have to... you guessed it, decapitate, and a bull kind of thing that you have to... repeatedly stab in the heart (fooled you there, didn’t I? ).But there are more weird things to explore, including crossing the river Styx (inside the train). As we progress the train gets more infernal and so do the flashes of colored blurs. At one point we almost forget we’re inside a train, but the passing lights remind us that the trip is still happening. It’s disturbing and confusing, ingredients that usually make a good horror game. A Mother’s Inferno has a unique atmosphere and a fantastic premise that compels us to keep going and discover what happened to our son, dragged in front of our eyes so quickly by forces we don’t understand. It’s not a perfect game; there’s a fair share of clipping issues and combat is more of a nightmare than it should be – and we’re sure that’s not a feature to go with the tone of the game. But it’s unlikely that you’ll forget this game anytime soon, which is a great thing! I Wont play it again but i had fun playing it!